This book is a comprehensive, technical yet readable, survey of 1000 years of monastic history, arranged broadly chronologically. Melville introduces and assesses the different forms of religious from the late antique Desert Fathers and Mothers to the varied communities of mendicants and hermits of the later Middle Ages. As the book progresses, the focus becomes increasingly on the structural systems of the orders, from the first limping towards an order by Cluny, to the first real order of the Cistercians, to the complex systems created by the Dominicans. This aspect of the story is not always highlighted well, but Melville brings it out and discusses why certain types of structure proved more successful as well as considering how institutions evolved over the centuries. The primary goal of all of these forms of religious life was a total commitment to Christ and a full abandonment to living by the Gospel, whether we are thinking of a hermit alone in the wilderness, a Benedictine with his brothers in a dormitory, a Franciscan preaching in a market, or a Dominican teaching in a university. How they represented challenges and opportunities to those in positions of power — secular nobles, bishops, popes — is also a part of this story, and Melville carefully brings this to the fore, helping dismantle along the way some ideas that ‘secular interference’ was necessarily detrimental to the achievement of a community’s original goal. Sometimes, yes. Sometimes, no. Moreover, Melville refers to the primary and secondary literature throughout. Since this is translated out of German, the secondary lit is often German, so that will not be helpful to the non-German-reading reader, but the primary sources are also often referred both to the Latin and to an available English translation. My own disappoints are small and do not detract from the qualilty of the book — eastern monasticism disappears in the High Middle Ages. Some of my favourite figures — Richard Rolle and Julian of Norwich, for example — do not appear. But the focus of the book is mostly western, as one has come to expect, and not every interesting person from the history of monasticism could expect to be covered. If you want to get your mind around the history of monasticism and situate the various strands, this book is for you. And if you are a Christian, you will find your own commitment to Christ and the ways you live that commitment challenged along the way — and that’s a good thing at any time. The Inheritance of Rome by Chris Wickham — my review available now! So, although I do have an actual article somewhere out there in editorial limbo, my first real, live book review has recently made an appearance in the online St. Francis Magazine. 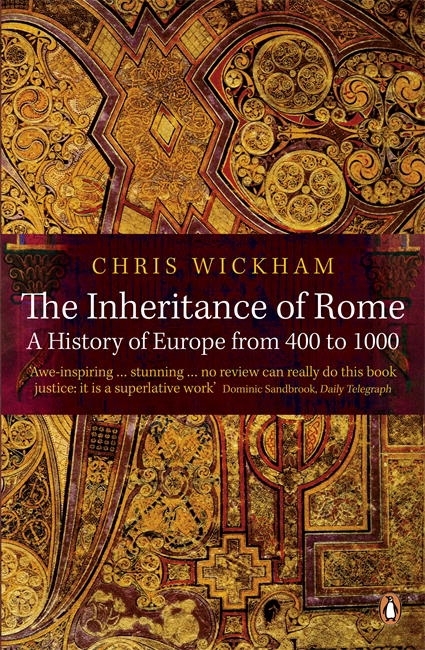 The book I review is the second volume of the Penguin History of Europe, The Inheritance of Rome: Europe from 400 to 1000 by Chris Wickham. I excerpt for you the opening paragraph, hoping you will go check out the whole thing! period not only in Europe, as the title claims, but in the whole Mediterranean world and the Middle East. Wickham starts us off by demolishing the grand myths of nationalism and modernism — the first that the states we see forming after Rome are the same thing as modern nation states that inhabit the same geographic space, the second that this was a ‘Dark Age’. Instead, he seeks to understand a transformative, influential period of history from the viewpoint of the men and women who lived it, not from any grand narrative, nor from a sense of inevitability. The story of this period as Wickham tells it is a good ride.